Most Americans (86%) state that transparency from businesses is more important than ever before. New research by Sprout Social digs into exactly what this means for brands and their agencies. Through social media, consumers are now in control of the PR cycle, aiming call-outs and backlash at brands (and their agencies). Surviving in this new era will require a DNA change in brands’ approach to social media, and to avoid striking out, it’s important for decision-makers to know what they’re aiming for, per the Sprout study. Four in 10 (40%) who say brand transparency is more important than ever before attribute it to social media. Heightened transparency expectations on social lead to significant benefits and risks. More than half of consumers (53%) are likely to consider brands that are transparent on social for their next purchase. However, a lack of transparency on social leaves 86% of people likely to take their business to a competitor. There is much room for improvement by brands. 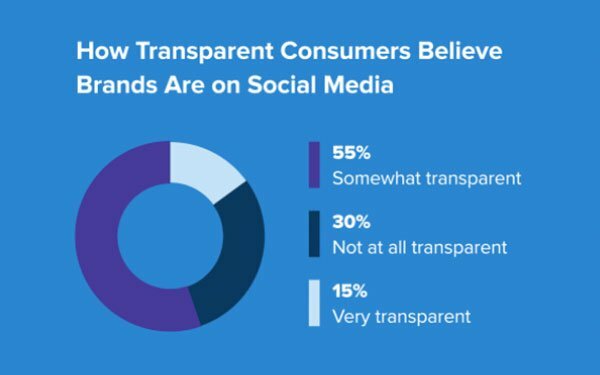 Only 15% of consumers believe brands are currently “very transparent on social media." And they don't expect perfection. 89% of people say a business can regain their trust if it admits to a mistake and is transparent about the steps it will take to resolve an issue. Content type also influences how transparent (or not) messages are perceived. People think video (67%) is the most transparent social media content, followed by text (23%), photos (6%), and GIF (4%). The report recommends brands utilize their CEOs to help sharpen their authenticity, listen to consumers via social media and invest accordingly, and make sure to elevate social transparency as a business strategy, not just a marketing effort. It only takes one poor interaction to turn away potential customers. Ultimately, Americans tend to set a high bar when it comes to brand behavior. More than eight in 10 (81%) believe businesses have a responsibility to be transparent when posting on social media—that’s higher than the standards they set for politicians, friends/family or themselves. Sprout Social surveyed 1,000 U.S. consumers on their transparency beliefs, expectations and desires for the report, "From Risk to Responsibility: Social Media and the Evolution of Transparency.” It can be accessed here. 1 comment about "New Report Tries To Define 'Transparency'". Alan Jurmain from On&Off, October 15, 2018 at 9:17 a.m.
On&Off Network’ Premium i Time digital advertising platform defines transparency as providing proof-of-performance for each and every impression by web site, web page, by minute, and even by second.